City and the capital of Rensselaer county in the state of New York; situated on the east bank of the Hudson River six miles above Albany. Although it was settled in 1787, no authentic record is found of a Jewish inhabitant until about 1842, when Emanuel Marks of Albany, now (1905) a retired merchant, established business relations with some of the people of Troy and, being pleased with their public spirit and progressiveness, settled in that city. He was followed in 1843 by Herman Levy and family, and in 1845 by Charles Wolf. In Sept., 1851, Emanuel Gratz, who also had settled in Troy, undertook the task of organizing a congregation. He rented two rooms, one for men and one for women, in the old Wotkyns Block on Congress street, and engaged a certain Königsberg as cantor for the holy days, thereafter officiating himself. In 1853, the membership having increased to eighteen, he organized a permanent congregation under the name "Anshe Chased." A hall was hired in Wotkyns Block and furnished in the Orthodox style. In 1855 dissensions arose among the members, and many withdrew, leaving in the old congregation but eight members, not sufficient for a quorum. The seceding members organized a congregation of their own. 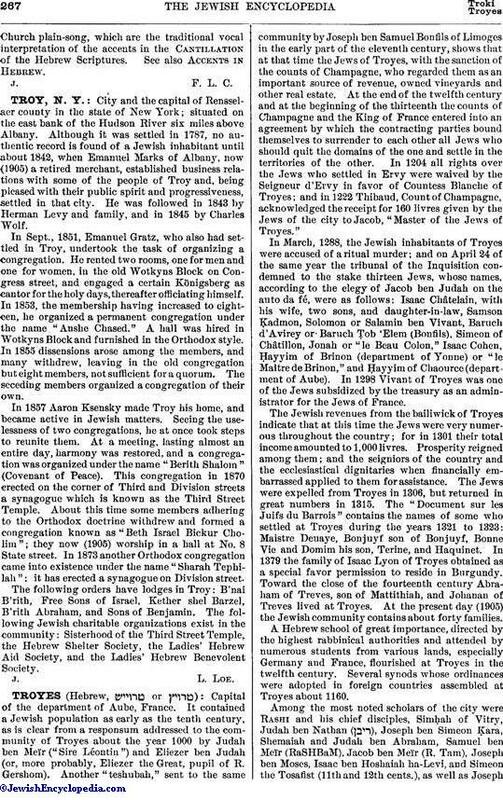 In 1857 Aaron Ksensky made Troy his home, and became active in Jewish matters. Seeing the uselessness of two congregations, he at once took steps to reunite them. At a meeting, lasting almost an entire day, harmony was restored, and a congregation was organized under the name "Berith Shalom" (Covenant of Peace). This congregation in 1870 erected on the corner of Third and Division streets a synagogue which is known as the Third Street Temple. About this time some members adhering to the Orthodox doctrine withdrew and formed a congregation known as "Beth Israel Bickur Cholim"; they now (1905) worship in a hall at No. 8 State street. In 1873 another Orthodox congregation came into existence under the name "Sharah Tephilah": it has erected a synagogue on Division street. The following orders have lodges in Troy: B'nai B'rith, Free Sons of Israel, Kether shel Barzel, B'rith Abraham, and Sons of Benjamin. The following Jewish charitable organizations exist in the community: Sisterhood of the Third Street Temple, the Hebrew Shelter Society, the Ladies' Hebrew Aid Society, and the Ladies' Hebrew Benevolent Society.